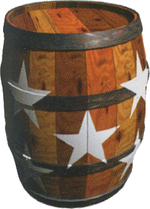 A Star Barrel (also known as a Check-Point Barrel and a Continue Barrel) is a Barrel with white stars painted on it, and serves as a checkpoint during a level, usually halfway through. They first appear in Donkey Kong Country, and appear in almost every level of the original Donkey Kong Country trilogy, Donkey Kong Land 2 and Donkey Kong Land III. In Donkey Kong Land, the Star Barrels were replaced with Continue Points. In Donkey Kong Country Returns and Donkey Kong Country: Tropical Freeze, Professor Chops instead marks the checkpoint for the Kongs. 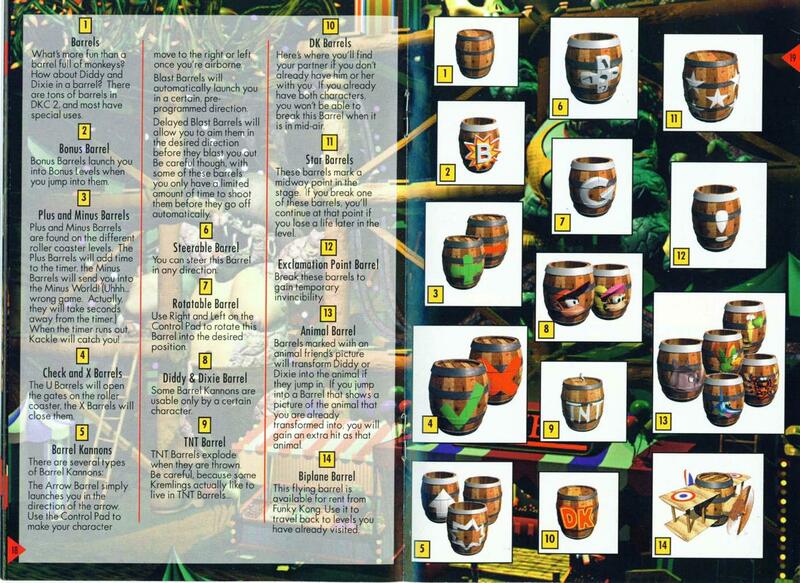 Star Barrels have the same role as a checkpoint in each game they appear in. Every Star Barrel floats in the air, with the stars spiraling around the barrel circumference. If the Kongs jump at a Star Barrel, it breaks, and a shower of colorful sparkles rains upon them, indicating that it has been activated. This way, if the Kongs exit a level or lose an extra life, they can resume from the Star Barrel's location. By doing so, the Star Barrel shakes, and the Kongs burst out of it. However, if the player gets a Game Over or restarts the game, the Kongs must restart from either the level itself or where the player last saved their game. A Star Barrel's effect also wears off when the Kongs complete a level. In the Game Boy Advance ports of the Donkey Kong Country trilogy, if the Kongs exit from a level where they have activated a Star Barrel, and the player saves and restarts their game, the Kongs can resume from the Star Barrel. In the original Super Nintendo Entertainment System release of Donkey Kong Country, there is a type of Star Barrel known as a Save Barrel. One of them appears at Candy's Save Point, and has the same appearance as ordinary Star Barrels. Unlike their normal counterpart, when the Kongs jump into a Save Barrel, the barrel does not break. In Donkey Kong Country 3: Dixie Kong's Double Trouble!, two of the Krematoa levels, Stampede Sprint and Rocket Rush, do not have a Star Barrel. "These barrels are decorated with a star design. If you knock out one of these barrels, you will restart at the barrel's location instead of beginning of the level when you lose a life." "These barrels mark a midway point in the stage. If you break one of these barrels, you'll continue at that point if you lose a life later in the level." "Star Barrels mark a midway point in the stage. If you break one of these barrels, you'll continue from that point." "Break open a star-spangled Continue Barrel to restart at that location the next time you lose a life." "These barrels mark a midway point in the stage. If you break one, you'll continue at that point should you lose a life later in the level. "These mark a midway point in the level. Break one to continue from that point if you lose a life before reaching the end." In Donkey Kong Country, there is also an unused sprite for the Continue Barrel with its top open. ↑ 3.0 3.1 Donkey Kong Country instruction booklet, page 17. ↑ Donkey Kong Country 2: Diddy's Kong Quest British English Virtual Console digital manual, page 7. ↑ Nintendo Power Issue 66, pages 11, 12, 15, and 17. This page was last edited on April 21, 2019, at 12:08.